Moscow and Managua are to cooperate over the next few years on the construction of the so-called Interoceanic Grand Canal, a new alternative to the Panama Canal. Deeper, wider, and longer than its rival in Panama, the new canal will challenge U.S. control over the region, though experts are divided on its geopolitical benefits for Russia. During Russian Foreign Minister Sergei Lavrov's recent visit to Nicaragua, the two sides discussed prospects for bilateral cooperation. One major project that will unite Moscow and Managua for the next several years is the so-called Interoceanic Grand Canal, a new alternative to the Panama Canal. A source close to parties present at the talks has told RBTH that the Nicaraguan authorities expect to start construction at the end of this year. At least, this is the timeframe envisaged in a tripartite agreement signed between Nicaragua, Russia and China. The new waterway will be 286 km long, while the Panama Canal is just 81.5 km long. 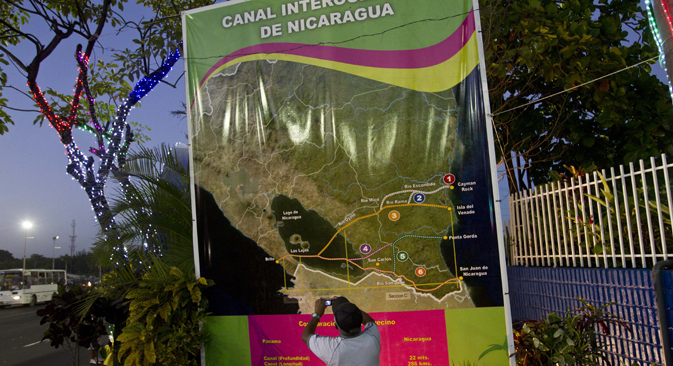 A significant section of the new canal will run through Lake Nicaragua, the largest lake in Central America. The main advantage of the new route is its width of 83 and depth of 27.5 meters, which would make it suitable for large-range ships with a deadweight of up to 270,000 tons. In other words, the Nicaragua Canal will be deeper, wider and longer than the Panama Canal. Two ports, an airport, an oil pipeline, and other facilities are also to be built as part of the project, the cost of which is estimated at $40 billion. The main investor is the Chinese company HKND, which has received a 100-year concession for building and operating the canal. The construction will be carried out by workers from China and Central America, while Russia, according to the RBTH source, will provide not so much economic and organizational assistance as military and political support. Russia’s role will be to guard the construction site against possible acts of provocation. To that end, the Nicaraguan authorities have signed a special agreement with Moscow, allowing Russian warships and aircraft to be present in its territorial waters for the first six months of this year and also to carry out patrols of the country's coastline in the Pacific Ocean and the Caribbean Sea until June 30, 2015. The idea of building a canal across Nicaragua first came up back in the 19th century. However, at the time the political situation in the country was unfavorable, not least because Nicaragua was under U.S. occupation. Later, the project would be at one time "almost decided" before dropping off the agenda once more. Finally, in September 2013, the parliament of Nicaragua passed the laws necessary to launch the construction of the canal. The prospects offered by the project are impressive: rapid GDP growth, an expanded labor market, new opportunities for small businesses, income from operating the canal, etc. Most interesting of all is that the construction of the new waterway will cost far less than the construction of the Panama Canal, which was built at the turn of the 20th century. Incidentally, the latter is currently being expanded and is expected to double its throughput capacity by 2016. The question is: How badly does Russia need the Nicaragua Canal and what geopolitical and strategic benefits will it offer Moscow? "After lengthy deliberations, Russia has finally agreed to take part in the construction of the canal, which promises to become a major transport route in the Western Hemisphere. Thus, the U.S. will lose a considerable part of control over a territory which, thanks to the Panama Canal, has been under its control for the past 100 years," Emil Dabagyan, a leading research associate with the Institute of Latin America under the Russian Academy of Sciences, told RBTH. In the opinion of the head of the Institute of National Energy, Sergei Pravosudov, Russia will benefit not only economically, but also geopolitically, as the U.S. would suffer a blow to its prestige. "America controls the main points that sea routes run through, the Panama and the Suez canals, as well as major trade routes going via Singapore, Gibraltar, etc. Therefore the emergence of an alternative waterway is a direct challenge to the U.S.," Pravosudov points out. However, other Russian experts think differently. In particular, political analyst Konstantin Simonov says the project is a very risky one. He points out that the canal is of interest not so much to Russia as to China, which needs it in order to export and import goods by a shorter route. Russia has its own Northern Sea Route, which allows ships to travel to Europe and Asia via the Arctic. According to Alexei Rei, head of the sector research center at the Russian Academy of Sciences' U.S. and Canada Institute, expanding the opportunities offered by the Northern Sea Route is among Russia's immediate interests. "From the point of view of the economy, it may even be more advantageous than the construction of the Nicaragua Canal," he concludes. The Nicaragua Canal is expected to be partially opened for operation as early as in 2019, with full completion of the project scheduled for 2029.